Feminine hygiene products were front and center at a “Free the Tampon Rally” Wednesday at UC Berkeley. The event was hosted by the YWCA of Berkeley and Oakland and attracted more than 100 students, according to social media posts. The goal? To spotlight women's need for menstrual products and subsequently improve access to these necessities across the UC Berkeley campus. To that end, organizers set up a table with free stickers and tampons at Sproul plaza. 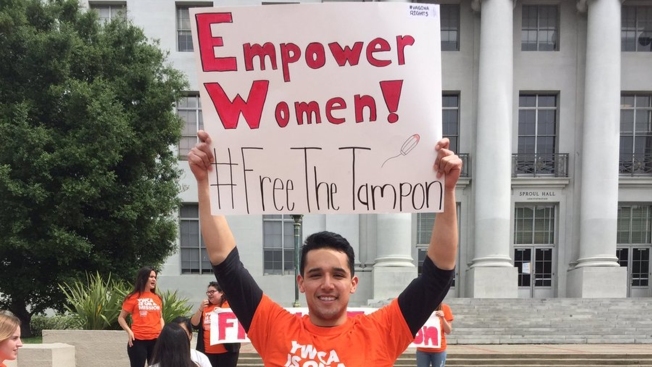 Signs, including “Free the Tampon,” bobbed in the crowd, while an organizer proved a point familiar to most women by smearing pink watercolor on her legs and skirt. Protesters pointed to Brown University as a success story where free menstrual products are provided in all campus restrooms. Amid musical performances, people stopped by to sign a board advocating support for the same at UC Berkeley campus as well, student Ashley Wong wrote on Twitter. UC Berkeley installed new gender-inclusive bathrooms on campus in 2016, but they still don’t offer tampons or pads, which puts an “economic burden” on students, Ollivier wrote in the statement. “We expect toilet paper and soap in public bathrooms. You’d complain if they’re not there. Menstrual products are just as necessary,” she stressed. Members of Happy Products, an organization that focuses on menstrual health in homeless communities, urged participants to help eliminate the stigma surrounding feminine health, Wong tweeted. "Access to menstrual products matters because dignity matters," she said to the crowd, according to Wong's tweets. "Restrooms in campus teaching and research facilities no longer have dispensors of menstrual products. They were removed because more often than not they were vandalized and the products and money were stolen. None of the Custodial staff I work with have been approached by students with a request that the campus provide free tampons. Our campus has had significant budget cuts to Custodial services over the past few years and the cost of menstrual products is not included in current budgets." NBC Bay Area's Raquel Dillon contributed to this report.